A city with over 800 years of history that has risen, fallen, and risen again, Liverpool is awash with all manner of important and beautiful buildings, many featuring glimpses of the mythical Liver bird which according to legend watched over the city and the sea. Fittingly, the most iconic building in the city is the Royal Liver Building on the waterfront at the Pier Head. Standing proudly since 1911, the Liver Building features the two largest Liver birds in the city atop the clock towers; one facing inland, one facing to sea. Further legend states that if these birds were to fly away then the city would cease to be, but luckily, they look like they have no intention of leaving. The Liver Building itself is part of the Pier Head’s ‘three graces’ which was granted UNESCO World Heritage status in 2004 and are the focal point of the waterfront. The other two ‘graces’ in question lie alongside the Liver Building and are the Cunard Building and the Port of Liverpool Building. The Liver Building is Grade I listed, one of 12 buildings in the city to achieve this certification, and is a 5-minute drive from the City Centre. Near to the Pier Head is the famous Albert Dock, also part of Liverpool’s UNESCO status. Once part of the city’s important and immense dock and port network, the Albert Dock of today is a bustling marina, home to a number of gift shops, restaurants, and the home of Tate Liverpool art gallery and the Beatles Story museum. The Albert Dock is also home to the Merseyside Maritime Museum which explores the importance of Liverpool as an international import/export hub during the British Empire, and the International Slavery Museum which explores the city’s shameful past as part of the slave trade up until its abolishment in the 1800s. Although Liverpool’s waterfront is comprised of many docks, the only other one worth seeing (aside from Albert Dock) is the Stanley Dock, which is a 7-10-minute drive from the City Centre. Seriously neglected since its heyday in the late 1800s, Stanley Dock is a preserved example of Victorian era architecture and design, and has been used by many movies and television shows such as guy Richie’s Sherlock Holmes (standing in for Victorian London) Captain America: The First Avenger (standing in for 1930s New York) and popular television show Peaky Blinders, with the latter also filming at other locations throughout Liverpool. Heading back inland, make a trip to William Brown Street, also known as the ‘Cultural Quarter’ of Liverpool due to its number of libraries, museums and galleries. Here you will find the Grade I listed St. George’s Hall and war cenotaph, the Walker Art Gallery (which was recently home to a controversial Banksy sculpture), the Liverpool Central Library and the World History Museum. The Liverpool Central Library is a must visit for the architectural marvel of the Picton Reading Room, where a whisper at one end of the room can be heard clear as day at the other end depending on where you stand. William Brown Street is in the heart of the City Centre. It is not just the design of these buildings which makes Liverpool an amazing city, but their functions as well as what has happened behind closed doors in Liverpool has reverberated around the world. You only have to stumble through Mathew Street to find the famous Cavern Club where the Beatles made their name, or a 5-minute drive up the road finds you at the Jacaranda; another Beatles venue from back in the day. Other historic drinking establishments include the Grapes, Ye Cracke and the opulent Philharmonic Dining Rooms, all situated in and around the City Centre, but take consideration and have a designated driver on hand if you are plnning on sampling a tipple or two. For culture fans who want to take in a show but wish to avoid the loud brash-ness of the Echo Arena, then stop by any of Liverpool’s famous theatres and venues. For grand concerts from everyone from the Philharmonic Orchestra to Brian Wilson of the Beach Boys then head to the Liverpool Philharmonic Hall, which has stood on Hope Street since 1939. A stone’s throw away from the Philharmonic is the Everyman Theatre, which has been producing radical and ground-breaking theatre since the 1960s. The Everyman has been very important to Liverpool’s acting and theatre scenes, helping launch the careers of local and national names such as Julie Walters, Bill Nighy, and Pete Postlethwaite amongst others. The Philharmonic Hall and the Everyman Theatre are a 10-minute drive from the heart of Liverpool City Centre. Lovers of the outdoors will want to take a trip to Sefton Park just outside the City Centre. Large and sprawling, Sefton Park is over 230 acres in area and is registered by the English Heritage society as Grade I listed park in the Register of Historic Parks and Gardens. Although featuring plenty of wooded and green areas, a lake, play areas and places to get food and drinks, the main attraction of Sefton Park is its magnificent Palm House, which itself is a Grade II* listed building and lies in the heart of the park. Standing proudly since the late 1800s, the Palm House houses a lush collection of various plants and flowers ranging from common to rare, and the Palm House has also been host to various music events from raves and hip-hop all-nighters to jazz and classical meets. Sefton Park is a 15/20-minute drive from Liverpool City Centre. If willing to venture further far afield, then pack the car and drive over to Crosby Beach, home of artist Antony Gormley’s ‘Another Place’ sculptures. One of Liverpool’s contemporary landmarks, ‘Another Place’ sees one hundred 6’2” cast iron statues wait on the beach, looking out towards the sea, with certain statues only visible dependant on the time of the day and the status of the tide. Crosby Beach is a 25-minute drive North of Liverpool City Centre. Book your hire car with Easirent in order to get around Liverpool and the surrounding area. 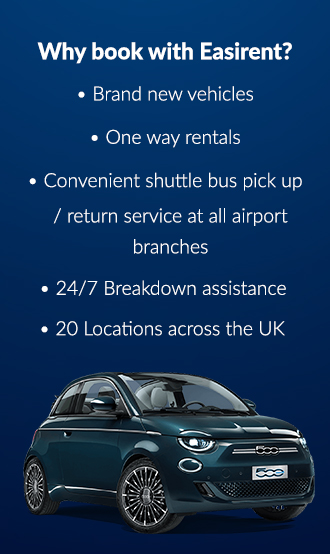 Our John Lennon Airport branch is the perfect place to pick up your vehicle. But why just stop at Crosby? If willing to venture just outside Liverpool to ‘woolyback town’ Birkenhead, you will find Hamilton Square, Birkenhead Park, and the ancient Birkenhead Priory. Hamilton Square itself contains the most listed and preserved buildings outside of London, all bedecked in a soft-yellow sandstone, while nearby Birkenhead Park was the world’s first public park and the inspiration for New York City’s Central Park, arguably the most famous park in the world. With Birkenhead Priory, you have the ancient ruins and relics from 12th century England where Benedictine monks lived and worshipped from the 1100s. The Priory is now partially reconstructed, with a learning and education centre on the grounds. Hamilton Square is a 10/15-minute drive from Liverpool City Centre, Birkenhead Park is a 20-minute drive, and Birkenhead Priory an 11-minute drive. Back in Liverpool, the city has the distinction of having not one but two cathedrals within the city walls; Liverpool Cathedral and Liverpool Metropolitan Cathedral, representing Church of England and Roman Catholicism respectively. Liverpool Cathedral is the largest religious building in Britain, and one of the biggest cathedrals in the world at 331ft (101m) in height and 207 yards (189m) in length. Liverpool Cathedral is also home to the largest pipe organ in the UK. Liverpool Metropolitan Cathedral (often playfully referred to as ‘Paddy’s Wigwam’ by the locals) was constructed in the late 1960s and houses over 2000 worshippers inside its circular altar hall. Beneath the cathedral you will find the crypt, which has been in place since the 1940s, left over from a previous attempt at building a catholic cathedral. The crypt annually hosts a craft beer festival which attracts beer and ale fans from all over the world to eat drink and be appropriately merry. Both cathedrals are roughly a 10-minute drive from the heart of Liverpool City Centre. And finally, why not pay a visit to Liverpool’s other cathedrals; Goodison Park and Anfield football grounds. Football runs through the veins of the city and the routine question of “are you a red or a blue?” is bound to pop up during your trip. Two of English footballs most successful teams, Everton FC and Liverpool FC play at Goodison and Anfield respectively, the two grounds are practically neighbours separated only by Stanley Park. Both grounds offer guided tours when no matches are taking place, but make sure to book well in advance. Both football grounds are a 10/15-minute drive from Liverpool City Centre, but bear traffic in mind on matchdays.